Friday 5th August, and we had the opening of a great sporting tradition…Pride Youth Games. 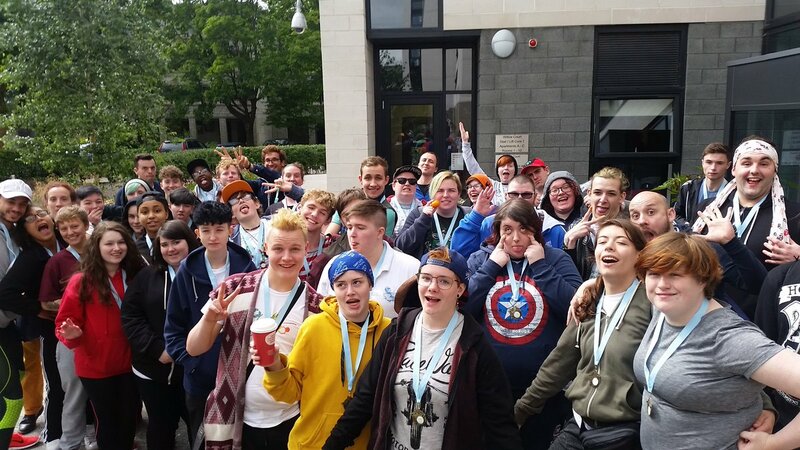 This year the Games took place at Stirling University organised as a partnership with LEAP Sports, Pride Sports UK and many youth work partners including LGBT Youth Scotland, Sheena Amos Youth Trust in Sheffield and Metro in London. Across the weekend, young people took part in Archery, Tennis, Softball, Handball, Football, Climbing, Wheelchair Basketball, Swimming and many other sports, interspersed with lots of other workshops and fun events including Lasertag Challenge, School Sports Day, and Pokemon hunting. There were also a series of focus groups held helping us to look at if, and how experiences of school sport have changed. Telling us why they came along, a young person from Midlothian told us “It’s great being somewhere that I can enjoy sports and not worrying about changing rooms or anything”. The Games have never been to Wales, and discussions have already started with partners LGBT Sport Cymru about hosting there next year. Organised by Pride Sports UK and youth work partners in the North of England, Pride Youth Games started over 10 years ago, and has recently been extended to become a weekend residential event with young people from England, Scotland and Wales taking part. Written on 10th August 2016.